CANONSBURG, PA, Nov. 7, 2018 /CNW/ - Corsa Coal Corp. (TSXV: CSO) ("Corsa" or the "Company"), a premium quality metallurgical coal producer, today reported financial results for the three and nine months ended September 30, 2018. Corsa has filed its unaudited condensed interim consolidated financial statements for the three and nine months ended September 30, 2018 and 2017 and related management's discussion and analysis under its profile on www.sedar.com. Unless otherwise noted, all dollar amounts in this news release are expressed in United States dollars and all ton amounts are short tons (2,000 pounds per ton). Pricing and cost per ton information is expressed on a free-on-board, or FOB, mine site basis, unless otherwise noted. Corsa reported net and comprehensive loss from continuing operations of $1.5 million, or $0.02 per share, for the third quarter 2018, compared to net and comprehensive income from continuing operations of $7.5 million, or $0.07 per share, for the third quarter 2017. Net and comprehensive loss from continuing operations for the third quarter 2018 includes $6.7 million of amortization expense of which $2.7 million, or $0.03 per share, resulted from the asset impairment reversal that took place in December 2017. Corsa's adjusted EBITDA(1) was $9.9 million and $8.5 million at its Northern Appalachia division ("NAPP" or "NAPP Division") and on a consolidated basis, respectively, for the third quarter 2018. Corsa's EBITDA(1) was $9.5 million and $6.9 million at its NAPP Division and on a consolidated basis, respectively, for the third quarter 2018. Operating cash flows provided by continuing operations for the third quarter 2018 were $6.5 million, which was consistent with operating cash flows for the third quarter 2017. Total revenue from continuing operations was $61.6 million for the third quarter 2018, a decrease of 2% as compared to the third quarter 2017. The decrease in revenue was attributable to the expiration of a thermal coal contract in December 2017. Corsa sold a total of 455,525 tons of metallurgical coal in the third quarter 2018. 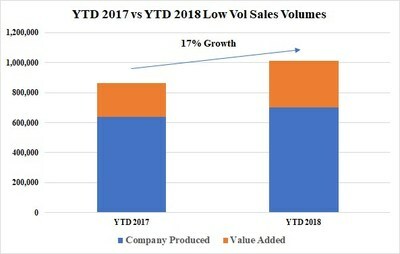 On a year-to-date basis, low volatile metallurgical coal sales volumes are up 17% versus 2017 comparable period levels, and total metallurgical sales volumes are up 22% as compared to year-to-date September 2017. This growth has been accomplished despite supply chain disruptions to export terminals and rail service. Corsa achieved an average realized price per ton of metallurgical coal sold(1) at its NAPP Division of $106.99 for all metallurgical qualities in the third quarter 2018. This average realized price is the approximate equivalent of $151 to $157 on an FOB vessel basis(2). For low volatile metallurgical coal sold, Corsa achieved the approximate equivalent of $157 to $162 on an FOB vessel basis(2). Corsa's sales mix for the third quarter 2018 included 40% of sales to domestic customers and 60% of sales to international customers. Cash production cost per ton sold(1) was $77.94 for the third quarter 2018, a decrease of $15.52 per ton as compared to the second quarter 2018. Cash production cost per ton sold(1) increased $7.65 per ton, or 11% as compared to the third quarter 2017. Corsa is at an advanced stage on discussions and expects to refinance or extend the maturity of our term loan beyond the August 2019 maturity date. This is a non-GAAP financial measure. See "Non-GAAP Financial Measures" below. Similar to most U.S. metallurgical coal producers, Corsa reports sales and costs per ton on an FOB mine site basis and denominated in short tons. Many international metallurgical coal producers report prices and costs on a delivered-to-the-port basis, thereby including freight costs between the mine and the port. Additionally, Corsa reports sales and costs per short ton, which is approximately 10% lower than a metric ton. For the purposes of this figure, we have used an illustrative freight rate of $30-$35 per short ton. Historically, freight rates rise and fall as market prices rise and fall. The low volatile metallurgical coal sales price is approximated at 3-4% above the equivalent metallurgical coal price on an FOB Vessel basis. As a note, most published indices for metallurgical coal report prices on a delivered-to-the-port basis and denominated in metric tons. George Dethlefsen, Chief Executive Officer of Corsa, commented, "In the third quarter of 2018 we began to realize returns on the investments made during the first half of the year, and we believe these investments will yield further improvement in the quarters ahead. Overall, our cash mining costs per ton sold(1) were down 16% in the third quarter 2018 compared to first half 2018 levels. This improvement in cash mining costs per ton sold(1) in the third quarter of 2018 was the result of experiencing more favorable geology and putting in service newly rebuilt mining equipment at the Casselman mine. At the Acosta mine, we achieved full production levels and achieved our highest quarterly production rate since beginning the mine. Low volatile metallurgical coal remains in very high demand both domestically as well as internationally as steel and coke prices remain profitable for producers. Supply disruptions in the United States and Australia have created a fragile supply situation for metallurgical coal and specifically for the low volatile metallurgical coal that we produce. Pricing on the US East Coast is at one-year highs and Australian spot prices are up approximately $35.00 per ton, or 20%, since the beginning of the third quarter. The forward pricing curve now averages around $200 per metric ton FOB Vessel for all of 2019. This uptick in pricing is expected to positively impact Corsa's fourth quarter 2018 earnings as well as 2019 earnings. Port congestion on the US East Coast has improved significantly, which will serve to substantially reduce demurrage expenses in the coming quarters. With the challenging geology at Casselman behind us, the ramp up at Acosta complete, the newly rebuilt underground mining equipment in service, the future reduction in demurrage expense and the increase in pricing we expect further increases in Adjusted EBITDA in the fourth quarter. We are providing guidance for the fourth quarter 2018 of $11 - $13 million of Adjusted EBITDA. We expect higher average realized prices and margin expansion to continue through the fourth quarter of 2018 and into 2019, leading to strong free cash flow generation in the quarters ahead. We continue to aggressively pursue volume growth, given the attractive returns profile of our organic projects. In the quarter, we upgraded our equipment at the Horning mine, which is now producing a low ash, low sulfur metallurgical coal that is very strategic in our Sales & Trading platform. Additionally, in the quarter, we upgraded mining equipment at our Casselman and Acosta mines. We continue to await the issuance of the mining permit for our Keyser project and expect this to be received later this year. Finally, we have had success drilling around our flagship Casselman mine and expect to significantly increase the reserve life of that mine. The Company is well positioned for the quarters ahead. Our face mining equipment rebuild initiative is complete and fully funded, we foresee favorable geologic conditions at our mines and the supply-demand balance for metallurgical coal remains favorable for metallurgical coal producers. We are well advanced in constructing our sales order book for 2019, having achieved price increases for our domestic orders and building a diversified international customer base with price exposure to both Australian and US-linked indices. Corsa's customer relationships, preparation plant infrastructure, rail access and coal storage capacity allow for full participation in the seaborne market and significant operating leverage to the rising price environment." 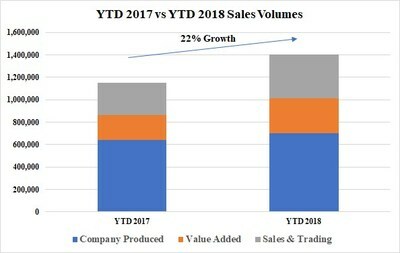 Corsa's total metallurgical coal sales and low volatile metallurgical coal sales have increased significantly for the nine months ending September 30, 2018 compared to the same period in 2017, as presented below. Corsa's metallurgical coal sales figures are comprised of three types of sales: (i) selling coal that Corsa produces ("Company Produced"); (ii) selling coal that Corsa purchases and provides value added services (storing, washing, blending, loading) to make the coal saleable ("Valued Added Services"); and (iii) selling coal that Corsa purchases on a clean or finished basis from suppliers outside the Northern Appalachia region ("Sales and Trading"). For the nine months ended September 30, 2018, Corsa's sales were broken down into the following categories. Cash production cost per ton sold excludes purchased coal. This is a non-GAAP financial measure. See "Non-GAAP Financial Measures" below. Cash cost per ton sold includes purchased coal. This is a non-GAAP financial measure. See "Non-GAAP Financial Measures" below. Note: Selling expenses are forecasted to be covered by margins from Sales and Trading tons sold. Guidance projections ("Guidance") are considered "forward-looking statements" and "forward looking information" and represent management's good faith estimates or expectations of future production and sales results as of the date hereof. Guidance is based upon certain assumptions, including, but not limited to, future cash production costs, future sales and production and the availability of coal from other suppliers that the Company may purchase. Such assumptions may prove to be incorrect and actual results may differ materially from those anticipated. Consequently, Guidance cannot be guaranteed. As such, investors are cautioned not to place undue reliance upon Guidance, forward-looking statements and forward looking information as there can be no assurance that the plans, assumptions or expectations upon which they are placed will occur. Previous Guidance was presented in the Company's MD&A for the three and six months ended June 30, 2018 dated August 28, 2018. Corsa's metallurgical coal sales figures are comprised of three types of sales: (i) selling coal that Corsa produces ("Company Produced"); (ii) selling coal that Corsa purchases and provides value added services (storing, washing, blending, loading) to make the coal saleable ("Value Added Services"); and (iii) selling coal that Corsa purchases on a clean or finished basis from suppliers outside the Northern Appalachia region ("Sales and Trading"). This is a non-GAAP financial measure. See "Non-GAAP Financial Measures" below for more information. Cash Production Cost per ton sold excludes purchased coal. Exclusive of stock-based compensation and selling related commissions, bank fees and finance charges. Tons sold excludes purchased coal used in the Sales and Trading platform. Over the past quarter market conditions have grown more constructive as there were several notable supply side-issues that constrained an already tight global supply chain. In addition to near term supply-side challenges, our global customer base expects continued growth in demand going into 2019. In response to supply disruptions and a positive demand outlook, prices have responded with United States East Coast export low volatile metallurgical coal pricing increasing 7% during the quarter and Australian premium low volatile metallurgical coal prices having increased by more than 6% for full-year calendar 2019 contracts. Corsa has been able to benefit from the strong global market by booking sales on indexed pricing mechanisms for the fourth quarter 2018 and into 2019. Global steel production is up 4.8% year-to-date ("YTD") and, excluding China, the rest of the world grew at 3.7%, according to the World Steel Association data. Chinese steel production grew 5.8% YTD while India is up 6.7% YTD. Global steel capacity utilization is approximately 79% and has been above 70% since early 2017. The strong global steel markets continue to drive a healthy US export market. US steel production is up approximately 4.0% YTD. Most of our domestic customers started the annual procurement process early this year as the global markets continued to tighten. We were able to capture increased sales prices from our domestic customer base while also growing our sales volumes. We continue to watch rising global freights rates, trade tariffs and the effects of a strong US economy which has made it difficult to find qualified workers throughout the supply chain. US port congestion and rail road performance have been considerable challenges to export shipments this year, but we have witnessed a recent improvement in both areas. Given these points, the forward curve continues to focus on the global supply side risks and we continue to expect a constructive forward price environment. Refer to Corsa's unaudited condensed interim consolidated financial statements for the three and nine months ended September 30, 2018 and 2017 and related management's discussion and analysis, filed under Corsa's profile on www.sedar.com, for details of the financial performance of Corsa and the matters referred to in this news release. Corsa also announces that its Board of Directors has granted stock options to purchase a total of 2,692,500 common shares of Corsa to certain directors, officers and employees of Corsa, which grant represents approximately 2.8% of the total outstanding common shares. These options were granted in accordance with Corsa's Second Amended and Restated Option Plan (the "2017 Plan"), are exercisable for five years at a price of the higher of (a) C$0.90, being the closing price of the common shares on the TSX Venture Exchange (the "TSXV") on November 6, 2018 or (b) the closing price of the common shares on the TSXV on November 9, 2018, being the date following Corsa's "blackout" period in connection with its third quarter 2018 financial statements, and are subject to the terms and conditions of the 2017 Plan and TSXV approval. Such options will vest one-third on the first anniversary of the date of grant, one-third on the second anniversary of the date of grant and one-third on the third anniversary of the date of grant. Officers of Corsa were granted an aggregate of 1,195,000 options, Corsa's non-executive directors, other than Robert C. Sturdivant and Kai Xia, were each granted 75,000 options and other employees of Corsa received an aggregate of 1,122,500 options. Messrs. Sturdivant and Xia are representatives of Corsa's significant shareholder Quintana Energy Partners L.P. and its affiliated investment funds, elected not to receive any options. Management uses realized price per ton sold, cash production cost per ton sold, cash cost per ton sold, cash margin per ton sold, EBITDA and adjusted EBITDA as internal measurements of financial performance for Corsa's mining and processing operations. These measures are not recognized under International Financial Reporting Standards ("GAAP"). Corsa believes that, in addition to the conventional measures prepared in accordance with GAAP, certain investors and other stakeholders also use these non-GAAP financial measures to evaluate Corsa's operating and financial performance; however, these non-GAAP financial measures do not have any standardized meaning and therefore may not be comparable to similar measures presented by other issuers. Accordingly, these non-GAAP financial measures are intended to provide additional information and should not be considered in isolation or as a substitute for measures of performance prepared in accordance with GAAP. Reference is made to the management's discussion and analysis for the three and nine months ended September 30, 2018 for a reconciliation and definitions of non-GAAP financial measures to GAAP measures. Corsa defines adjusted EBITDA as EBITDA (earnings before deductions for interest, taxes, depreciation and amortization) adjusted for change in estimate of reclamation provision for non-operating properties, impairment and write-off of mineral properties and advance royalties, gain (loss) on sale of assets and other costs, stock-based compensation, non-cash finance expenses and other non-cash adjustments. Adjusted EBITDA is used as a supplemental financial measure by management and by external users of our financial statements to assess our performance as compared to the performance of other companies in the coal industry, without regard to financing methods, historical cost basis or capital structure; the ability of our assets to generate sufficient cash flow; and our ability to incur and service debt and fund capital expenditures. Management also uses adjusted EBITDA for the purposes of making decisions to allocate resources among segments or assessing segment performance. All scientific and technical information contained in this news release has been reviewed and approved by Peter V. Merritts, Professional Engineer and the Company's President - NAPP Division, who is a qualified person within the meaning of National Instrument 43-101 - Standards of Disclosure for Mineral Projects. The estimated coal sales, projected market conditions and potential development disclosed in this news release are considered to be forward looking information. Readers are cautioned that actual results may vary from this forward looking information. Actual sales are subject to variation based on a number of risks and other factors referred to under the heading "Forward-Looking Statements" below as well as demand and sales orders received. Certain information set forth in this press release contains "forward-looking statements" and "forward-looking information" (collectively, "forward-looking statements") under applicable securities laws. Except for statements of historical fact, certain information contained herein relating to projected sales, coal prices, coal production, mine development, the capacity and recovery of Corsa's preparation plants, expected cash production costs, geological conditions, future capital expenditures and expectations of market demand for coal, constitutes forward-looking statements which include management's assessment of future plans and operations and are based on current internal expectations, estimates, projections, assumptions and beliefs, which may prove to be incorrect. Some of the forward-looking statements may be identified by words such as "estimates", "expects" "anticipates", "believes", "projects", "plans", "capacity", "hope", "forecast", "anticipate", "could" and similar expressions. These statements are not guarantees of future performance and undue reliance should not be placed on them. Such forward-looking statements necessarily involve known and unknown risks and uncertainties, which may cause Corsa's actual performance and financial results in future periods to differ materially from any projections of future performance or results expressed or implied by such forward-looking statements. These risks and uncertainties include, but are not limited to: risks that the actual production or sales for the 2018 fiscal year will be less than projected production or sales for this period; risks that the prices for coal sales will be less than projected; liabilities inherent in coal mine development and production; geological, mining and processing technical problems; inability to obtain required mine licenses, mine permits and regulatory approvals or renewals required in connection with the mining and processing of coal; risks that Corsa's preparation plants will not operate at production capacity during the relevant period, unexpected changes in coal quality and specification; variations in the coal mine or preparation plant recovery rates; dependence on third party coal transportation systems; competition for, among other things, capital, acquisitions of reserves, undeveloped lands and skilled personnel; incorrect assessments of the value of acquisitions; changes in commodity prices and exchange rates; changes in the regulations in respect to the use, mining and processing of coal; changes in regulations on refuse disposal; the effects of competition and pricing pressures in the coal market; the oversupply of, or lack of demand for, coal; inability of management to secure coal sales or third party purchase contracts; currency and interest rate fluctuations; various events which could disrupt operations and/or the transportation of coal products, including labor stoppages and severe weather conditions; the demand for and availability of rail, port and other transportation services; the ability to purchase third party coal for processing and delivery under purchase agreements; and management's ability to anticipate and manage the foregoing factors and risks. The forward-looking statements and information contained in this press release are based on certain assumptions regarding, among other things, coal sales being consistent with expectations; future prices for coal; future currency and exchange rates; Corsa's ability to generate sufficient cash flow from operations and access capital markets to meet its future obligations; the regulatory framework representing royalties, taxes and environmental matters in the countries in which Corsa conducts business; coal production levels; Corsa's ability to retain qualified staff and equipment in a cost-efficient manner to meet its demand; and Corsa being able to execute its program of operational improvement and initiatives. There can be no assurance that forward-looking statements will prove to be accurate, as actual results and future events could differ materially from those anticipated in such statements. The reader is cautioned not to place undue reliance on forward-looking statements. Corsa does not undertake to update any of the forward-looking statements contained in this press release unless required by law. The statements as to Corsa's capacity to produce coal are no assurance that it will achieve these levels of production or that it will be able to achieve these sales levels.